The easiest way to determine "hype," whatever that is, for a product is to measure the size of its media scrum. New Mustang? Meh. How about a Mercedes? Borrrrring. But Honda just enthralled everybody with a 14-year old robot. These press conferences are usually all the same. Everyone lines up at the manufacturer's stand about ten minutes early, because these things tend to get crowded with various Media Types in varying levels of Pudgy and representatives from other carmakers looking to scope out the competition. Music of varying levels of crappiness begins to blare way too loudly, from Beck's "Gamma Ray" to something I'm pretty sure was sourced from a Radio Disney ad. An executive, invariably old, white, and male (I can say that because I am one), gets up and then says many boring things, usually about how their sales figures are the best. Somehow everyone's sales figures are the best. Then they introduce a car like it's a BIG REVEAL, even though it's something that probably debuted as much as three years ago. This is supposed to still impress you, somehow, even though you have an Internet connection and/or access to a newspaper subscription, if you are an Old, so you've already seen everything that debuted at the Detroit auto show. I will say hi to you on Twitter, or something. Really not gonna go further than that. Don't get me wrong, the Ghost is a great car, and when you sit in the world's most comfortable bank vault that is the back seat, the world just melts away. But that video, I do not understand. Anyways. Sometime after that point, they will describe how their new car is the best, in some way, be it number of backup cameras or the highest contrast in seat stitching. This is the point in which most begin to blackout, and people holding cameras start to go weak in the limbs. PR people take this as their cue to start serving drinks, whether its a pineapple smoothie (Mini) or a glass of champagne (Bentley). Most of these drinks are inevitably refused by all in attendance, except for the older guy in the rumpled suit with the gray beard and ponytail who is also somehow balding. He loves them smoothies. But sometimes, just sometimes, an automaker will try to throw a wrench in the works, especially if the BIG REVEAL isn't that big, or revealing at all. This is usually in the form of an even bigger deal than the BIG REVEAL, or, at least, what the company tries to push as an even bigger deal. Ford brought out the Mustang 50th Anniversary, mostly to distract from the mid-life Focus update. Not that there's anything wrong, per se, with a mid-life Focus update, but the little family sedan might not be the most exciting thing under the sun. So if you want to attract people to the Ford stand, you bring out a Mustang that's celebrating history. But what if you're Honda? It's not like you can attract the Masses in droves with a celebration of the S800. Dorks like us might love that sort of thing, but not the regular show-going member of the media. If you're Honda, you'll have to look towards the future. And that's where ASIMO comes in. ASIMO debuted in 2000, but it was a result of a long process of evolution starting with the terrifyingly post-apocalyptic looking Honda P1. It's all wires and metal and clamps with a box on its head, and it represents the hellscape of your dystopian nightmare. OMG ASIMO SO CUTE I JUST WANNA HUG IT. 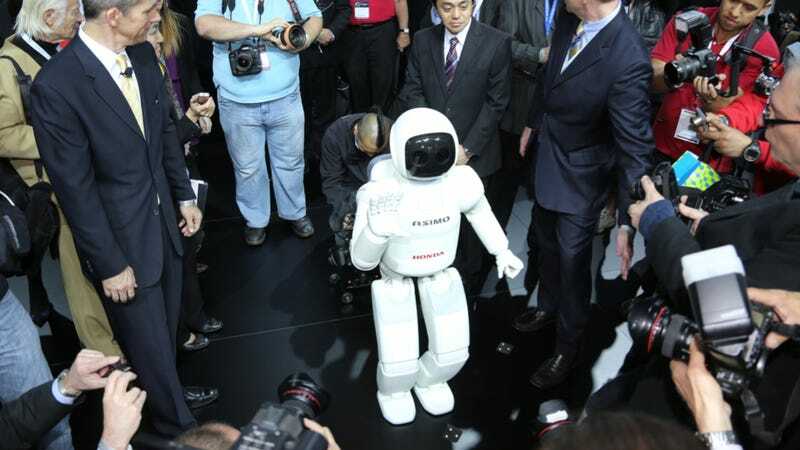 And what press conference was ASIMO at? The 2015 Honda Fit press conference. And if you want anybody talking about the car that will generate millions upon millions of dollars of cash for your company? It helps to have the biggest thing at the auto show.